Thickly butter and dust with flour two 1-quart molds (or dome-shaped china, ceramic or glass bowls). Set aside. Beat the 1/2 pound of butter until soft. Add sugar and beat until fluffy. Gradually beat in the eggs and syrup. Sift flour with salt and spices; fold into the butter mixture with the lemon juice, grated rinds, bread crumbs, fruits, mixed peel and brandy. Spoon mixture into the 2 prepared molds. If molds don't have lids, cover each with a circle of waxed paper, then a piece of foil pleated across the center and securely tied in place. Leave overnight in refrigerator. Let cool completely, then cover with a clean piece of waxed paper and a pudding cloth (muslin or closely woven cheesecloth) secured with a string and ends of the cloth tied in a knot over the pudding mold. Leave in the refrigerator to mature before using. Before serving, steam about 3 hours. Remove from mold. To serve, garnish with holly and ignite with brandy. What is meant by "self rising fluid" ? 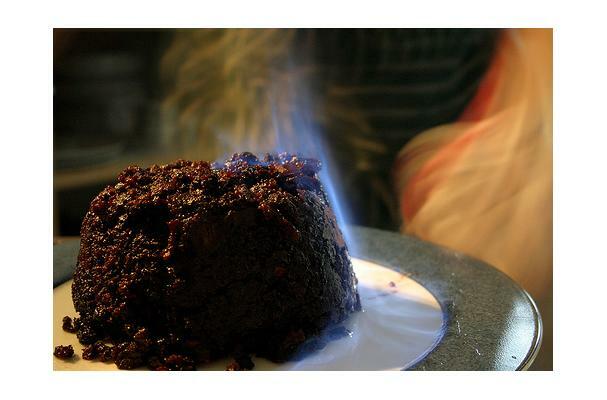 Christmas pudding is the dessert traditionally served on Christmas day, although still available and popular throughout the year in Britain. It originated in England, and is sometimes known as plum pudding.